When it comes to the experimental tools that researchers use to understand pain at the cellular and molecular level, dorsal root ganglion neurons from animals—and more recently from human donors—have traditionally received most of the fanfare. But there is a new game in town. Pain researchers are now turning to induced pluripotent stem cells (iPSCs), and the sensory neurons that can be derived from them (iPSC-SNs), to understand painful conditions and the neurobiological mechanisms that drive them. Two new studies now show the value of this “pain-in-a-dish” approach, particularly when combined with more traditional strategies, in patients with rare pain disorders caused by mutations in the sodium channel Nav1.7. The first study, led by Stephen Waxman, Yale University, New Haven, US, and VA Connecticut Healthcare System, West Haven, US, focused on a family with the painful disorder inherited erythromelalgia (IEM), which is due to gain-of-function mutations in Nav1.7. In all affected family members, the causative mutation in Nav1.7—S241T—was the same. But the family’s mother had only moderate pain from the condition, while her son had severe pain. Using iPSC-SNs derived from each individual, the investigators found differences in the electrical excitability of these cells that matched up with the dissimilar pain profiles the mother and son exhibited. Further, the researchers used whole exome sequencing to show that the mother’s resilience to pain was due, to a large degree, to a variant in KCNQ2, a gene that encodes a potassium channel. The study “is a really elegant demonstration that peripheral sensory neuron excitability links directly to pain phenotypes,” said Ted Price, University of Texas at Dallas, US. “Finding the difference in excitability between the mother and the son, and then doing whole exome sequencing to narrow down to a very specific potassium channel that explains most of the difference between these two individuals provides a remarkable level of detail. If you had told me when I was a graduate student that we would be doing this in the pain field within 15 years, I don't think I would have believed you,” said Price, who was not involved in the research. The work was published January 16, 2019, in the Journal of Neuroscience. In the second study, David Bennett, University of Oxford, UK, and colleagues also used iPSC-SNs, in this case to reveal that loss-of-function mutations in Nav1.7 resulted in a lack of functional nociceptors in three individuals with congenital insensitivity to pain (CIP). As with the work from Waxman and colleagues, the study also shows the benefits of using iPSC-SNs in combination with other techniques, here including sensory profiling, microneurography, brain imaging, and gene editing, to reveal a more complete picture of a painful condition. “This is a very good paper that really makes an advance in understanding how Nav1.7 is working and how it is helping to transmit signals that lead to a painful sensation,” said Angelika Lampert, Aachen University, Germany. “It’s really nice that this research covers the full range, from studying patients all the way to molecular biology. And it uses iPSCs, where you actually have the patients’ full genetic background in the cells, offering the chance to look at Nav1.7 almost in its natural environment. This research really helps us understand the role of this channel,” according to Lampert, who also studies pain and Nav1.7 using iPSC-SNs (see her recent findings here and here). The study from Bennett and colleagues was published March 6, 2019, in Neuron, with an accompanying “Preview” from Waxman and Sulayman Dib-Hajj. For years, Waxman’s group has been studying IEM, which is known as “Man on Fire Syndrome.” Patients with this condition have intense pain—searing, burning, scalding pain—in response to mild warmth. Most people with IEM do not respond to existing drugs, but in 2009, Waxman and colleagues identified a Nav1.7 mutation, called V400M, in an IEM family who did respond, in this case to the sodium channel blocker carbamazepine (Fischer et al., 2009). A couple of years later, based upon publication of the crystal structure of a bacterial sodium channel by William Catterall and colleagues (Payandeh et al., 2011), Waxman and co-workers created a homology model of the human Nav1.7 channel into which they put the V400M mutation as a “seed” in order to look for other mutations in their patient database that might respond to carbamazepine. This model predicted that another mutation, S241T, fit the bill, which in vitro work would confirm (Yang et al., 2012). Next came a four-year-long human study of two IEM patients—a mother and son pair in North America—whom Waxman’s team would identify as having the same S241T mutation. Both individuals responded to carbamazepine (Geha et al., 2016). The researchers had the mother and son each keep a detailed pain diary over 14 weeks, which allowed the investigators to gain a good sense of their pain phenotype, helping form the basis of their new study. In their new study, the group decided to use iPSC-SNs to answer that question, also looking at the family’s father, who was unaffected by IEM and did not carry the S241T mutation. The team thought the odds were slim, but worth trying. “We wondered if we could make sensory neurons from iPSCs that would capture or reproduce the individual differences in pain profiles between these two family members. We knew it was a long shot, since the expectation of most pain researchers would be that something happening in the mother’s brain made her resilient to pain, rather than in her peripheral sensory neurons,” Waxman said. But the bet paid off. The group first confirmed that the iPSC-SNs had key characteristics of mature neurons, and that S241T mutant Nav1.7 transcripts were present in the mother-son pair while only wild-type transcripts were seen in the unaffected father. Then began a number of electrophysiology studies of the iPSC-SNs. First, using multi-electrode array (MEA) recordings to gain a global picture of the cells’ electrophysiological properties, the researchers found differences in each subject’s cell-firing properties in response to different temperatures. Abnormal firing in response to warmth was seen in the iPSC-SNs from both the son and the mother. But the pattern of hyperexcitability paralleled their dissimilar pain phenotypes, according to co-first author Yang Yang, who did the MEA experiments. “We saw very few action potentials in IPSC-derived sensory neurons from the father, while the mother’s cells showed intermediate firing. But the son’s neurons fired like crazy,” said Yang, who recently left Yale for a faculty position at Purdue University. “We thought if we were seeing such a strong neuronal phenotype through this very global way of looking at neuronal firing properties, we should perform a more in-depth study to try to uncover the molecular mechanisms,” he said. The group, including co-first author Malgorzata Mis, then extended their electrophysiology studies to the level of membrane excitability. Whole-cell patch clamp would also reveal alterations in iPSC-SN excitability that paralleled the different pain profiles of the study subjects. In particular, the son’s cells fired the most action potentials in response to depolarizing stimuli; had the highest percentage of neurons firing repetitively; had the lowest current threshold needed to fire an action potential; and had the most depolarized resting membrane potential. On each of these measures, iPSC-SNs from the unaffected father showed the least excitability, while the mother’s cells, hyperexcitable as they were, sat somewhere in the middle between the father and the son. Additional electrophysiology experiments would show that it was the differences in resting membrane potential that accounted for the dissimilarities in cell excitability. Then, by removing those differences, the son’s and the mother’s iPSCs looked similar. “After finding differences in the resting membrane potential, we saw that by depolarizing the mother’s cells by 4 millivolts, or hyperpolarizing the son’s cells by 4 millivolts, we were able to obliterate the differences in cell excitability,” according to Mis, who performed these experiments. To understand how the differences in iPSC-SN excitability between the son and the mother came about, the group then performed whole exome sequencing on samples from the family. They also used a tool called ingenuity pathway analysis (IPA) to filter variants identified by the whole exome sequencing according to their expression in dorsal root ganglion (DRG) neurons. This led to identification of 90 variants between the son and the mother. Considering their electrophysiology findings, the investigators homed in on a missense variant in KCNQ2 that was present in the mother but not in the son. KCNQ2 is a gene that encodes a potassium channel, Kv7.2, which is known to control the excitability of nociceptive DRG neurons. The mutation turned out to be of the gain-of-function variety, and it increased a type of potassium channel current called M current. “We still don't know a lot about the function of voltage-gated potassium channels, compared to voltage-gated sodium channels,” Price told PRF. “It would behoove us as a field to try to get a better grasp on this because there are a lot of studies now waving the flag that voltage-gated potassium channels are also really critical for these changes in excitability, and we're just way behind on that,” Price told PRF. The researchers next hypothesized that the mutation in the mother made her more resilient to pain, and turned to dynamic clamp—which combines patch clamp electrophysiology and computer simulation—to test the idea. The hypothesis turned out to be correct. “What the dynamic clamp method allows you to do is very quantitatively and precisely subtract the mutant current from the mother’s cells and replace it with wild-type current,” said Waxman. “And that flipped the mother’s cells so they looked like the son’s cells,” in terms of their electrical excitability. The group would show that the mutation decreased the excitability of the mother’s cells by hyperpolarizing the resting membrane potential and increasing the current threshold. Waxman also stressed that, ultimately, the findings show that pain resilience doesn’t stem only from brain mechanisms. “We’re not minimizing the importance of modulatory mechanisms at higher levels; they’re real, and they’re important. But what we are saying is that there are peripheral mechanisms of pain resilience, at least in this patient. Putting it in a very sort of gross parlance, pain resilience is not only in your head. It also can be in your peripheral nervous system,” according to Waxman. The research also shows the fruits of the iPSC-SN approach. “It is labor intensive and complex, but it is possible to model interindividual differences in pain profiles using a pain-in-a-dish model, based on iPSCs. And by combining the iPSC work with whole exome sequencing, you can find a protective or modulatory gene variant,” Waxman explained. In the study from Bennett and colleagues, the researchers also used iPSC-SNs, along with a host of other techniques, this time to examine the contribution of Nav1.7 to CIP. While this condition is known to result from loss-of-function mutations in Nav1.7, exactly where the problem lies within the nociceptive system, and how the channel affects the neuronal excitability and function of nociceptors was not well understood, according to Bennett, who led the study. iPSC-SNs would play a big part in helping to answer these questions, but the researchers first carried out detailed sensory profiling in the three individuals with CIP who took part in the study, all of whom had confirmed compound heterozygous mutations in Nav1.7. Quantitative sensory testing (QST) revealed, as expected, that these individuals could not detect noxious heat or noxious mechanical stimuli, but had normal mechanical and vibration detection thresholds. These and other findings suggested that small fibers had compromised functioning, while large-fiber function was unaffected. Also in support of small-fiber abnormalities were intra-epidermal nerve fiber density measurements that showed a very low density of nerve fibers in the skin, as well as experiments with microneurography (which records activity from individual nerve fibers innervating the skin). These recordings showed an absence of nerve fibers with the characteristic features of C-fiber nociceptors. “This paper is thought provoking. I wonder, if Nav1.7 KO [knockout] mice could live to 30, would they lose epidermal innervation? My bet is that loss of innervation results from the pain-free state of the patients rather than causing it,” wrote John Wood, University College London, UK, in a comment on the paper to PRF. “There is clearly a loss of nociceptive input in both mouse and human null mutants, but the possibility that there are no viable nociceptors in human nulls is not proved by the microneurography data. It is plausible that, as with mice, humans have remaining functional nociceptors that fail to transmit information to the CNS because of lack of neurotransmitter release,” according to Wood (see full comment below). Finally, patch clamp recordings in a heterologous expression system in which the researchers expressed new Nav1.7 variants identified in their CIP study subjects showed a complete loss of function of the channel. The researchers also used arterial spin labeling, which provides an indirect measure of brain activity in the form of changes of cerebral blood flow, in one of their CIP patients. They found that, in response to capsaicin applied to the skin, this individual showed markedly reduced cerebral blood flow changes in just a few brain areas compared to healthy controls, who showed widespread increases through many cortical territories. Further, when looking at the neurological pain signature (NPS), a pattern of brain activity previously found to be associated with physical pain in healthy experimental subjects (Wager et al., 2013), the investigators found significantly greater NPS response values in healthy controls, compared to the CIP patient. “The controls both felt intense pain and had a marked increase in the neurological pain signature. The patient with CIP didn’t feel pain, and there was a massive reduction in the cortical response,” said Bennett. The investigators also wanted to test other sensory modalities beyond pain. “When you ask the patients about their symptoms, everything’s very much centered around the fact that they can’t feel pain, but we realized that there may be some more subtle deficits in other sensory modalities, including itch, which has a lot in common with pain but hadn’t really been studied in these patients,” Bennett noted. Interestingly, the researchers found that the patients exhibited a flare reaction to the itch-causing substance histamine, and to mustard oil, but reported neither itch nor pain. The presence of a flare suggested that some nerve fibers in the skin could respond to noxious stimuli and produce action potentials. Experiments with iPSC-SNs further elucidated the picture of pain in the CIP study participants. The investigators first characterized the iPSC-SNs that they made, finding that these cells expressed Nav1.7 and looked similar to human DRG neurons in terms of the genes they expressed. Further, the researchers used CRISPR, a gene editing technique, to knock in a hemagglutinin (HA) tag to the Nav1.7 gene. This enabled them to see trafficking of the channel within the cell. “The antibodies to human Nav1.7 aren’t fantastic, so by knocking in the HA tag, we had a really good means of probing the localization of the channel in the iPSC-derived nociceptors,” said Lucy McDermott, co-first author of the study, along with Greg Weir, both of the University of Oxford. “And one of the interesting things was that we found it quite enriched in axonal terminals, suggesting that it might have quite a big role there,” according to McDermott, who performed the CRISPR experiments. 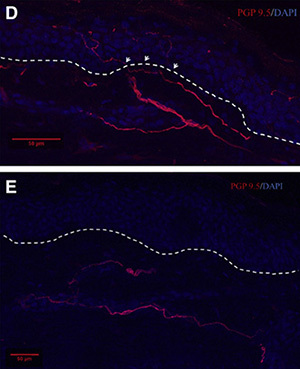 This finding was consistent with previous reports showing similar localization of the channel in rodent DRG neurons. Nav1.7 was also present at the cell body and along the axon, and a co-culture of the iPSC-SNs with Schwann cells revealed expression of Nav1.7 in nodes of Ranvier in myelinated axons. Having established the trafficking of Nav1.7, the group next looked for differences between iPSC-SNs from healthy control donors and those from CIP donors. The latter were less excitable, requiring more current to fire an action potential, and firing less in response to prolonged suprathreshold depolarizing current. Use of CRISPR to correct one allele of SCN9A, the gene that encodes Nav1.7, in iPSC-SNs from one of the CIP patients normalized the amount of current required to generate an action potential. This showed that loss of the channel played a causal role in the hypo-excitability of the cells. Finally, iPSC-SNs from CIP patients and those from Nav1.7 knockout iPSC-SNs generated from healthy controls had similar electrophysiological properties. “The iPSC-SN experiments show that Nav1.7 is a threshold channel—the threshold is elevated, and you really need the channel to set it,” said Lampert. Consistent with this idea is recent electrophysiological work from her group using iPSC-SNs from IEM patients, which showed a decreased action potential threshold in the cells (Meents et al., 2019). Also of note from the iPSC-SN studies was that upregulation of endogenous opioids in response to loss of Nav1.7, something seen in a previous study from Wood and colleagues (Minett et al., 2015), did not seem to contribute to the electrophysiological phenotype of the Nav1.7 knockout iPSC-SNs. This was because the researchers saw no changes in the phenotype when they treated the cells with naloxone, an opioid antagonist, nor did they see upregulation of the endogenous opioid proenkephalin in the knockout cells. In a final set of experiments, the group showed the value of the iPSC-SN approach to test the specificity of Nav1.7 inhibitors, which are being developed by companies in the pain arena. “Really what you want is a super-specific inhibitor that is just going to inhibit Nav1.7 and leave all of the other voltage-gated sodium channels alone,” said Weir. “We thought the knockout nociceptors would be a good model to test whether drugs that are going through clinical development are truly specific for Nav1.7, because if they had any effects on a neuron that we know is devoid of Nav1.7, then they must be acting on other proteins,” according to Weir, who performed this work. He found that of the two inhibitors he tested, one appeared specific for the channel, but the other did not. In the latter case, the inhibitor decreased excitability not only of healthy control iPSC-SNs but also of the Nav1.7 knockout nociceptors as doses were increased, suggesting that it also acts on other ion channels. “This gives a word of caution that you really don’t want to escalate the dose too much with that compound or it might become more nonspecific,” said Weir. In addition to its potential use as a preclinical screening tool to assess inhibitor specificity, the iPSC-SN approach also has promise for clinical translation and individualized treatment. For instance, a recent study from Lampert’s group observed hyperexcitability of iPSC-SNs derived from a patient with small-fiber neuropathy (Namer et al., 2019). Lacosamide, an approved drug for the treatment of epilepsy that affects sodium channels, reduced this defect in vitro, and, as the electrophysiological findings from the iPSC-SNs predicted, the patient experienced significant pain relief in response to the drug. Thus, a treatment examined with the help of iPSC-SNs improved a pain condition that, in this case, had lasted for more than 10 years. The future appears bright for iPSC-SNs as an approach to learn more about pain and enhance prospects for drug development. But they have their limitations, which all the researchers recognize. In terms of the methods and technology available to pain researchers, what the new studies of iPSC-SNs ultimately show is that any temptation to replace the old with the new should be tempered by the realization that shiny new things may provide the most value when used in combination with the tried-and-true. Featured image credit: blueringmedia/123RF Stock Photo. Resilience to Pain: A Peripheral Component Identified using induced Pluripotent Stem Cells and Dynamic Clamp. J Neurosci. 2019 Jan 16; 39(3):382-392. Defining the Functional Role of Nav1.7 in Human Nociception. Neuron. 2019 Mar 06; 101(5):905-919.e8. The Two Sides of Na1.7: Painful and Painless Channelopathies. Neuron. 2019 Mar 06; 101(5):765-767. In the accompanying paper, Bennett, Serra, and Tracey make an important claim with broad implications for the understanding of pain mechanisms through animal models. They propose that loss of function in the voltage-gated sodium channel Nav1.7 abolishes nociceptor activity, which causes a functional neuropathy in humans. Is this a structural or functional silencing? This is the key question for drug development strategies. In mice, the principal deficit seems to be nociceptive input into the dorsal horn, rather than loss of sensory neurons. Peripheral neurons are the locus of the deficit because sensory neuron-specific gene deletion causes profound analgesia that is even greater when sympathetic neurons lose the expression of Nav1.7. The mechanisms involved in murine analgesia include some neuronal silencing, potentiated opioid receptor signaling, increased enkephalin production, and a range of other transcriptional effects, together with loss of neurotransmitter release (Isensee et al., 2017; Minett et al., 2012; Raouf et al., 2012). However, despite altered properties, nociceptors are present and activatable in KO [knockout] mice, as judged by electrophysiology studies and GCaMP imaging (Hoffmann et al., 2017). Thus, if there is a physical loss of nociceptors in humans, the same gene mutations and same phenotype are caused by different mechanisms in mice and humans—a giant nail in the coffin of those who use animal models for drug development. What is the basis for the neuropathy claims? Firstly, intra-epidermal nerve density was very low in their three adult human nulls. However, this could be the result of dying back through inactivity, as flare responses dependent on functional peptidergic nociceptors were still present. CGRP release peripherally is normal in mouse KOs, whilst central substance P release is lost (Minett et al., 2012). CIP patients with normal nerve densities and functional innervation have been well described, inconsistent with the interpretation of the current paper (Klein at al., 2013). It is known that some mouse neurons are silenced in the absence of Nav1.7 (Raouf et al., 2012; Hoffmann et al., 2017). Extracellular recording examining ADS [activity-dependent slowing] in an analogous way to microneurography shows no deficits in A-fibers but loss of some C-fibers with slower conduction velocities in the remaining functional units in mice, but functional nociceptors conducting action potentials are present (Hoffmann et al., 2017). Here microneurography shows deficits in C-fiber nociceptors, although A-delta and A-beta nociceptors may still be present. So the opaque data provided by microneurography does not rule out the existence of responsive nociceptors, despite the failure to identify C-fiber nociceptors. Much of the paper exploits the use of iPSC-derived nociceptors from the patients that are analyzed as though they are bona fide human nociceptors. This claim is problematic. Even bona fide cultures of nociceptors show artefactual properties compared to their counterparts in vivo (Emery et al., 2016). The protocol used to differentiate these cells produces a massive expression of Nav1.8 mRNA, the TTXr [tetrodotoxin-resistant] channel that far outstrips the levels of Nav1.7 expression, although not necessarily the channel protein. Only 1 to 2 percent of the cells are capsaicin sensitive, showing that these cell lines are quite heterogeneous (Chambers et al., 2012). There are 17 distinct types of somatosensory neurons defined on the basis of transcriptional profiling at the latest count from the Linnarsson group (Mousebrain.org). Which sort are the present lines? The observation that Penk is not upregulated in the human iPSC Nav1.7 KO cell lines can be interpreted as a deficiency in the accuracy of the model rather than a fact about human sensory neurons. Some mysteries remain—why were the CIP patients not assessed for pain sensation with the opioid antagonist naloxone? If their pain-free state is the result of absence of nociceptors, then opioid action would be irrelevant—this would strongly support the neuropathy hypothesis. The original observation of human naloxone-sensitive analgesia cries out for replication (Minett et al., 2015). Why were the CIP patients not analyzed with BOLD imaging (Salomons et al., 2015). Interestingly, the single CIP patient did show signals in components of the optimistically named “pain matrix,” again suggesting some sensory input as a result of capsaicin action on TRPV1-activated central pathways. This paper is thought provoking. I wonder, if Nav1.7 KO mice could live to 30, would they lose epidermal innervation? My bet is that loss of innervation results from the pain-free state of the patients rather than causing it. There is clearly a loss of nociceptive input in both mouse and human null mutants, but the possibility that there are no viable nociceptors in human nulls is not proved by the microneurography data. It is plausible that, as with mice, humans have remaining functional nociceptors that fail to transmit information to the CNS because of lack of neurotransmitter release. This could be the locus of action of the opioid system and is incompatible with neuropathy but compatible with functional silencing. In mice, intrathecal Nav1.7 antagonists are potent analgesics that are compromised by application of naloxone (Chen et al., 2018). Before pharma closes down all their Nav1.7 programs, someone needs to test centrally permeant Nav1.7 antagonists with and without opioids in humans. In rodents this is a very effective way to resurrect potent non-analgesic Nav1.7 antagonists (Deuis et al., 2017). In summary, the Bennett data demonstrate neuronal silencing, but do not prove that Nav1.7 null analgesia is linked to loss of nociceptors. A novel Nav1.7 mutation producing carbamazepine-responsive erythromelalgia. Structural modelling and mutant cycle analysis predict pharmacoresponsiveness of a Na(v)1.7 mutant channel. Pharmacotherapy for Pain in a Family With Inherited Erythromelalgia Guided by Genomic Analysis and Functional Profiling. Endogenous opioids contribute to insensitivity to pain in humans and mice lacking sodium channel Nav1.7. Pain relief in a neuropathy patient by lacosamide: Proof of principle of clinical translation from patient-specific iPS cell-derived nociceptors.